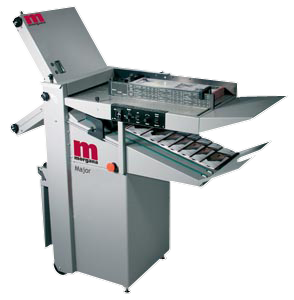 A number of unique features have been developed to ensure that the Morgana Major can handle output from digital processes, as well as litho printing. Like all Morgana products, the Major offers unmatched performance and value. A larger sheet size of 365mm width and 648mm length makes the Morgana Major even more flexible, capable of producing 6pp A4 documents. The machine speed is fully adjustable from 4500 to 27,500 sheets per hour, giving the operator complete control over the production of a wide range of stocks. The many different printing processes available today can affect the characteristics of paper, creating curled or easily marked material. At the same time run lengths can vary from short to very long. The Morgana Major can handle both. When buying any equipment, running, maintenance costs and residual values are an important considerations. The Morgana Major has been designed to fulfill these criteria. An example are the fold rollers. These are extremely durable and are located in a single patented pull-out cassette. When replacement is needed, non-skilled personnel can achieve replacement in less than five minutes. The Major fold-plate has ‘dial-a-fold’ which enables all adjustments to be made without removing the covers. An LED display accurate to 0.1mm shows the fold plate position and allows easy and accurate repeat job settings.